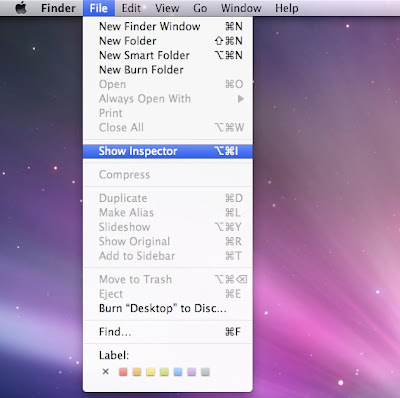 A New Mac Tip Every Day: The Finder Inspector! The Finder has a slightly modified version of the "Get Info" window that is the Finder Inspector. What the Inspector basically does is it stays open even if you click on other files. It really displays the same information than the "Get Info" window does. What happens is that when you click on another file, the info displayed switches to the info of the other file. The Get Info command in the Finder's File menu switches to "Show Inspector" when you hold down Option. The shorcut is "Option - Command - I". Oh, that is very handy. It will be especially useful in finding the length of video files--instead of opening a dozen "Get Info" windows, we can click on each in turn. Thanks, once again, for a very helpful hint! Something else you can do with the Inspector is find the combined sizes of multiple files. Cool. I wanted to know the combined size of many files and I thought I wouldn't be able to do this on the Mac. Thanks for sharing this tip.